If you’ve already copied your music collection to your computer, or if you use your computer as your main music storage system, you can share that music with the Droid Bionic. Connect the Droid Bionic to the PC. Pull down the USB Connection notification. Choose the item Windows Media Sync and touch the OK button. On your PC, start Windows Media Player. You can use most any media program, or “jukebox.” These steps are specific to Version 12 of Windows Media Player, though they’re similar to the steps you take in any media-playing program. If you see a device window for your Droid Bionic in Windows 7, choose the item Manage Media on Your Device. If necessary, click the Sync tab in Windows Media Player. 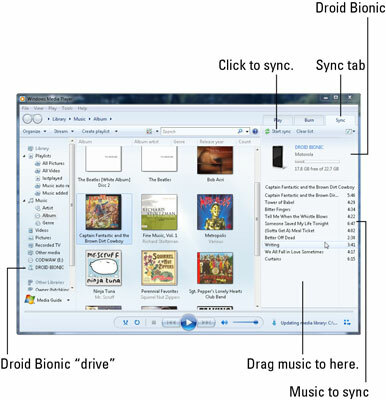 The Droid Bionic appears in the Sync list on the right side of Windows Media Player, as shown. Drag to the Sync area the music you want to transfer to the Droid Bionic. Click the Start Sync button to transfer the music to the Droid Bionic. Unmount the Droid Bionic from the PC’s storage system. When you have a Macintosh, or you detest Windows Media Player, you can use the doubleTwist program to synchronize music between your Droid Bionic and your computer. The Droid Bionic can store only so much music! Don’t be overzealous when copying over your tunes. In Windows Media Player, a capacity-thermometer thing shows you how much storage space is used and how much is available on your phone. Pay heed to the indicator! You cannot use iTunes to synchronize music with the Droid Bionic. You can synchronize music using iTunes, but only when you install the iTunes Agent program on your PC. You then need to configure the iTunes Agent program to use your Droid Bionic with iTunes. After you do that, iTunes recognizes the Droid Bionic and lets you synchronize your music. The Droid Bionic cannot access its storage (music, photos, contacts) while it’s mounted to a computer for music syncing. You can access this information after you unmount the phone from the computer.